Being guildmaster doesn’t mean I’m the best scribe in the group. Far from it, in fact. Most of the scribes in Gyldenholt are far more experienced and skilled than I am. What it really means to be guildmaster is that I host the baronial scriptorium. 1. (historical) A room set apart for writing, especially one in a monastery, library, or other institution where manuscripts are stored, read, or copied. 2. (modern scholarly use) The output of written, painted, and/or illuminated documents from a specific monastery or other institution. Miniature of Vincent of Beauvais writing in a manuscript of the Speculum Historiale in French, Bruges, c. 1478-1480, British Library Royal 14 E. i, vol. 1, f. 3, probably representing the library of the Dukes of Burgundy rather than a normal situation. (From Wikipedia.) Y’all, he looks so miserable. Won’t someone please fetch him a Diet Coke and massage his poor aching hand? Medievally speaking, most scriptoria (if not all — I’m not certain, and I’m not going researching today) were indeed in monasteries. However, there is only a little evidence for whole rooms devoted to the scribal arts. Most often, the work seems to have been done in the monks’ own cells, or in tiny cubicle-like recesses in the cloisters. Within what the SCA likes to call the “modern middle ages,” meaning basically all of us who play, we use the term in both ways, plus referring to a regular or impromptu meeting in which people practice the scribal arts, or teach them to one another. In my case, saying “I host a scriptorium” means that once a month, anyone interested comes over to my home and gets things done on their scribal work that wouldn’t get done if they had all the distractions of home and family. Sometimes one of us will teach a ‘class’ to the others, while other times we work in companionable silence, each to her or his own task. Being scribal guildmaster, I feel some responsibility to help other people do what I can do, however limited I am, and then get beyond me in their skills. So far I’ve been doing that by handing people my own calligraphy pens and nibs and book and setting them loose. Some enjoy it, but I can sort of tell that most don’t, which is a shame, because calligraphy is great fun. But now I’m pretty sure that I’ll be able to help a new person learn what I know, too. Here’s how. When I first took over the guild from my predecessor, Emma Rose d’Harfleur, she handed me a small box with some supplies: a couple of paint brushes, some tubes of paint, and of course the box itself. Later on, Astrid skalphæna offered a box of pigments — not mixed with glair or oil, just pure pigments on their own. Hrodnavar, another Gyldenholter whose actual name I won’t embarrass myself by mangling at this time, had once thought to take up the scribal arts, and had kitted himself out with some watercolors, gouaches, brushes, papers, books, calligraphy nibs, and so on. With all of that, I reasoned, I had a really great start on… on something. I wasn’t sure what, and so most of those supplies have languished. Till now. Valeria Cabrielli, one of the best scroll artists in Caid, is teaching me to paint. Under her tutelage I’ve learned which colors of modern gouaches I can buy that will bring a period look to my work, because those colors existed and were available in Europe prior to the 17th century. Looking at the colors she directed me to buy, a plan flowered in my mind at last. Daiso Japan has some terrific supplies, all for very low prices. The day that I bought my own palette, I wasn’t looking for art supplies at all, but I like to wander the aisles and see what’s there. Not even a week after I bought the paints with Valeria’s help, I was in Daiso and spotted some plastic palettes. They’re pretty much perfect: twelve slots for paints, a larger mixing area, a hole for the thumb if you’re standing to paint, and best of all, a lid. Like most other things at Daiso, the palettes were $1.50US each. Sold! In fact, I bought all that they had. About a dozen, all told. When I arrived home, I quickly filled my own palette with period paint colors, then put away my own paints so as not to get them mixed up with the guild’s paints — I didn’t want to accidentally take as my own something that properly belongs to the barony. With my own palette still open, and my written list of my own paints’ names by my side, I rifled through the guild’s paints, separating them by type. Astrid’s pigments went into their own Ziploc baggie. Since they’re unlabeled, I can’t be sure which were period colors and which were modern until my eye is better trained. More experienced painters will be able to use those. I separated out the watercolors from the gouaches. Valeria explained that watercolors are less opaque than gouaches, and gouaches would probably be easiest to use. I’m brand-spanking-new to painting, and anyone who needs me to learn from is also new, so easier is better. The watercolors went into their own baggie. I put some of the gouaches into their own baggie, too: the ones that are in colors that either didn’t exist during the SCA’s chosen time period, or weren’t available in Europe. 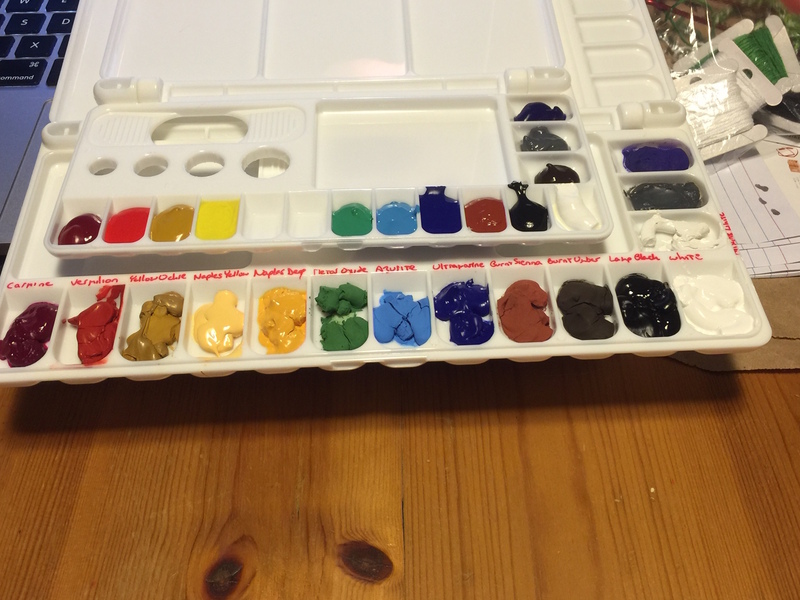 I took the gouaches that are in period colors and filled slots in each of the Daiso palettes, the same slots that they occupy in my own palette, leaving empty slots where there were period colors that don’t appear in our donations. That was when I started to get actually creative. I found modern colors that approximated the carmine and the Naples yellow deep. They’re not perfect, but they’re really pretty close. I mixed three colors together to get darned near to a perfect match for azurite, three to get kind of close to chromium oxide, and five to get impressively close to vermilion. I used a bright primary yellow to approximate lead-tin yellow, a period color that I was just sure I could get close to. Bottom: My palette. Top: Baronial scriptorium palette. Notice that one yellow is totally wrong, and two more are missing. Fret not: I won’t be upset with anyone who doesn’t use that entirely wrong yellow, and I’ll eventually get some proper yellows to put into the baronial palettes. That is, until I ran out of some of the colors. It breaks my heart to tell you this, but I ran out of two of the shades that were helping me towards the faux-vermilion, before I ran out of slots in palettes. So about four of the palettes contain a red that is both too orangey and too bright to be vermilion. Also, when the paints dried, I found that my “near perfect” faux-azurite is actually a wee bit too warm a color, and the faux-vermilion (with all the mixed-in colors available, not the three or four bits that didn’t have that) is a little closer to dried blood than I might like. The lead-tin yellow, as it turns out, is actually nothing like the one on my computer screen, so the substitute that looked perfect is actually pretty far away. However, drying out helped my “not really right” chromium oxide mellow into darned near perfect. Come to scriptorium and, using these paints or whatever anyone else wishes to loan you, complete the painting of one calligraphed scroll or one scroll blank. Decide you want to be a proper scribe, completing scrolls for the good of the kingdom. Show me you mean it, by showing up with the brushes you’ve bought for yourself. I’ll give you a palette of your very own, and that should keep you going until you can buy more paints to replace the ones in the palette. A few lucky sorts will also get one or two paintbrushes in a case that I’ve prepared, or a spray bottle and an extra lidded cup they can use for wetting their brush while painting, or whatever other useful things I can scrounge. PS, as usual, if you show up and try calligraphy and commit to that, you may have the nib and nib holder that you use when learning (if I can spare them — they will be coming out of my own supplies, not the guild’s, so it’ll be a matter of whether I do or don’t have any more at the time that I can use for my own work). Donations of materials or money will be put first towards enhancing the kit used at scriptorium, then towards these beginner kits. I’m also considering making up some kits for sale, for those who don’t want to wait until they’ve completed a scroll to get their take-home paints. Update: Yesterday was the first baronial scriptorium since I made up these paints. A lovely newish scribe came in, and she brought an empty palette which she planned to fill with paints she’s just bought in a kit. We did the same with her palette and period/non-period mix of paints that I’d done with the donated paints and palettes, only this time I had more experience with color mixing, and the results were even better. What she didn’t have in her kit, we made up for with some baronial top-offs, and it worked just fine. So the first recipient of my mad mixing skillz went away happy. I’m so glad! 🙂 Just be clever about it. Kits cost less than individual tubes of paint, but so far as I’ve found, there’s not a kit out there that’s made up of *only* period pigments, so you’ll wind up either making a lot of mixes that are very far from perfect, or having some paints you can use and some paints you can’t, at least for SCA purposes. Buy the period-correct colors to start with. The good news is, if you care to spend $100 or so (depending on how cheaply you can get your palettes, basically), you CAN outfit a barony with a dozen (or more) paint palettes and possibly some brushes or little spray bottles.